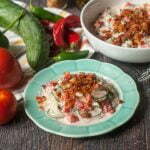 This ranch bacon cucumber & tomato salad is creamy and cool and has that salty crunch of bacon. A delicious way to use fresh tomatoes and cucumbers from the garden. Nothing tastes better than a fresh tomato from the garden. Until you’ve eaten a million of them, made sauce with them and even canned your own salsa. However they still sit there on the counter mocking you so you try find other ways to eat them. 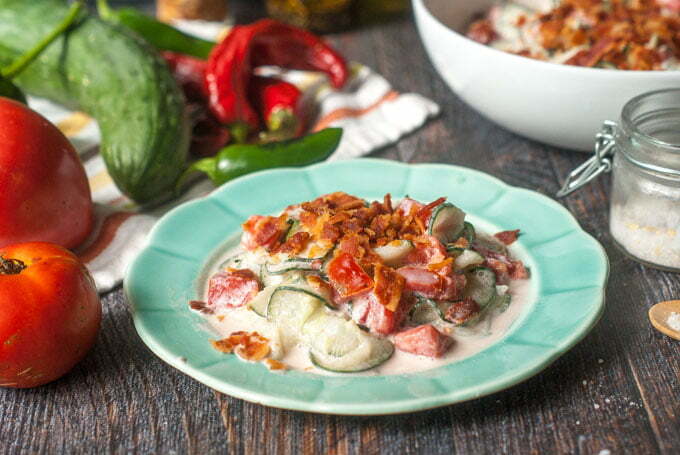 And that is how I came up with this ranch bacon cucumber & tomato salad. 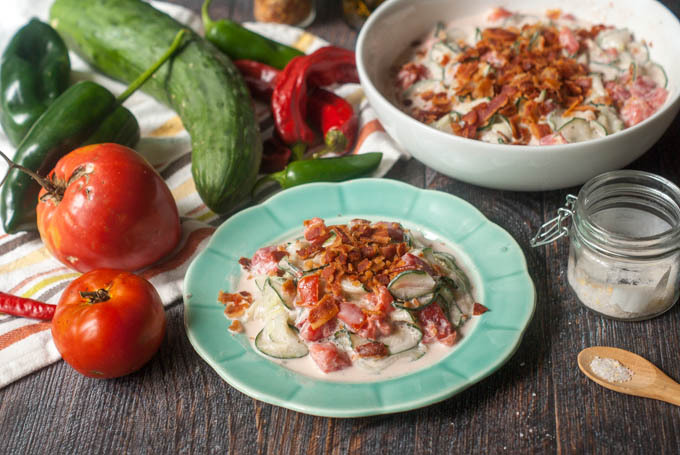 I wanted to use some of the last cucumbers from our garden as well as the abundant tomatoes and combined with the creamy ranch dressing and bacon. It wasn’t much to look at but it sure tasted great! Our cucumber were stellar this year. They were crunchy and the practically seedless. Even the gigantic ones tasted good. 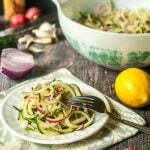 So I cracked out my old spiralizer and made these ribbon noodles for the salad. 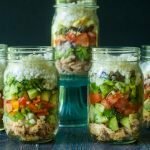 My mother used to make cucumber salad with vinegar and dill but I know other people eat their’s with sour cream. So today I wanted to try a creamy dressing with sour cream and ranch dressing mix. 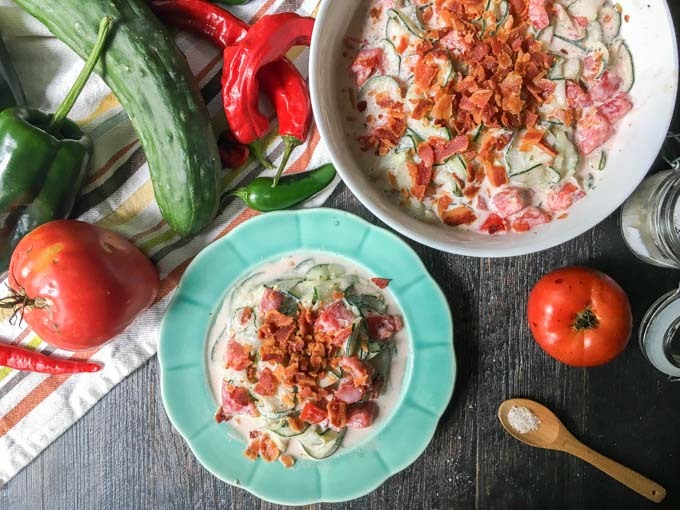 I used my fresh tomatoes and cucumber ribbons and topped it with bacon. It’s salty, crunchiness seemed like the perfect ending to this dish. 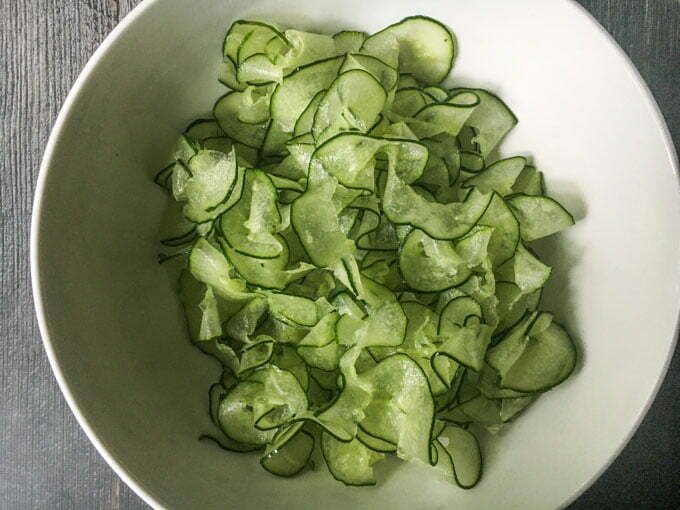 A few tips about this recipe: Drain as much water as you can from both the cucumber noodles and the chopped tomatoes. I would go so far as to use a few paper towels to dry off the cucumber noodles. There is a lot of water in both of these vegetables so this dish will get watery. Plan on eating it as soon as you make it. I’m embarrassed to say that I eat this whole bowl for both lunch and dinner. I really like this taste combination and will definitely be making it again next summer. Hopefully I will save some for someone else. 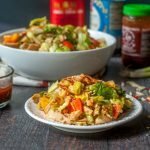 If you like this dish you may like my Asian lemon ginger cucumber recipe too. Enjoy! 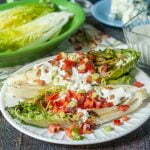 In a bowl, mix the sour cream and ranch seasonings. Chop and slice vegetables and pour off any excess liquid.